The days are flying by! I can hardly believe that Christmas is next Wednesday. So much to do, and yet what needs to be done will get done. It always does. I covered a kraft box (similar to our kraft gift boxes) with Season of Style designer series paper using Tombow Multi-purpose adhesive. 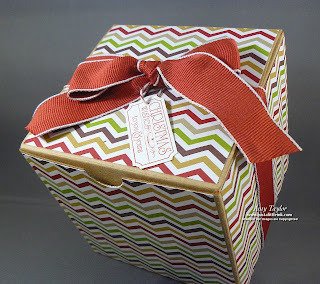 Then I wrapped a bow around it using the Cherry Cobbler 1" Stitched Edge Grosgrain Ribbon. It's finished off by adding a tag from the That's the Ticket stamp set (stamped with Cherry Cobbler ink and punched out with the coordinating punch), tied on with a piece of Cherry Cobbler Baker's twine. Simple, fast and a great way to use any extra designer series paper you might have.